Thursday morning I woke up and took a shower. I packed our overnight bag and woke up the girls. 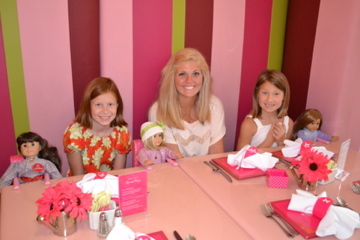 They went down for breakfast and I told them that Aunt Bethie and Anna were coming over to see them this morning. I told them they should change clothes- that we were going to have some girl time with them. I went upstairs with them and helped them select the dresses we brought. They thought that was strange. Beth and Anna arrived and we jumped in the car. My kids were so happy to see them they don’t seem to notice that we are driving a long way. Around Anniston, they ask if aunt bethie and anna have to drive this far to go shopping every day. Beth stops at an exit and fills up the car. 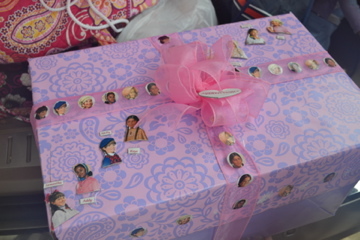 Anna pops the trunk and gives Olivia a huge pink box with pink ribbon and the faces of all the American Girls on it. Anna had used some stationary that she owned and cut out each little face. 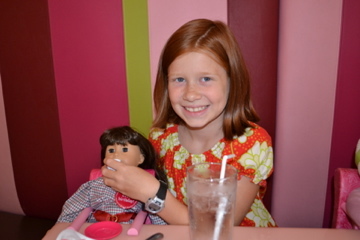 Olivia reads the card and learns that Anna is giving her the Samantha doll that used to be Anna’s. 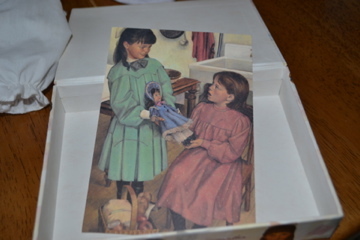 The card references the Samantha’s story in which Samantha shares her own doll Lydia with her best friend Nellie. Anna wrote,”I am giving you Samantha today. She was my very first American doll and now it is time to pass her on...” Inside the box (and it was wrapped like awesome presents on tv where you get to lift the lid off!) 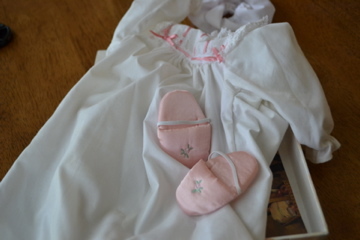 was Samantha and a set of her pajamas and a card written by Samantha. 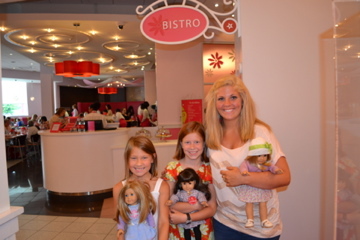 It told Olivia and Emma that we were going to the American Girl Store in Atlanta and eating at the bistro and then spending the night in a hotel. The girls could not believe it!! We got there just in time. We looked around and then headed to the bistro. 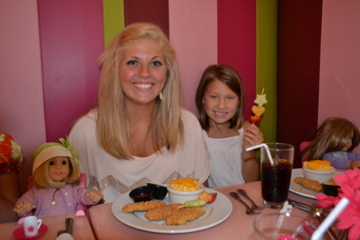 It is the cutest place a girl could want to eat at. Olivia brought her Samantha. 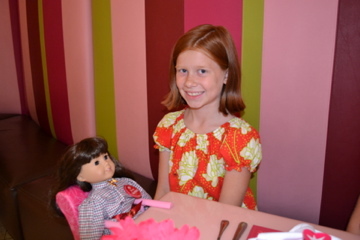 Each doll gets a seat at the table too. 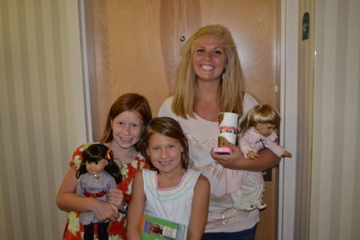 Anna brought Kit and Emma brought her Just-like-me doll Abby. How cute is that wall behind them! 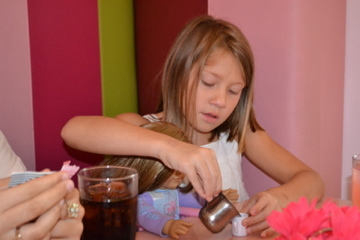 The dolls are brought tea cups and water. The food was delicious. Chicken fingers. cute fruit kabobs. mac-n-cheese. And then we had dessert!! 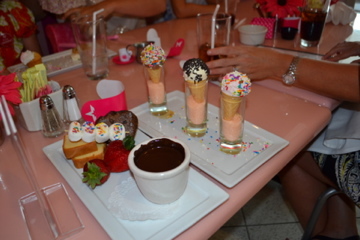 Mini ice cream cones, chocolate fondue and a mini cupcake for Olivia. The girls tried on pajamas. They thought it was just a fashion show. But we surprised them with them later. It was time to get the dolls’ hair done. 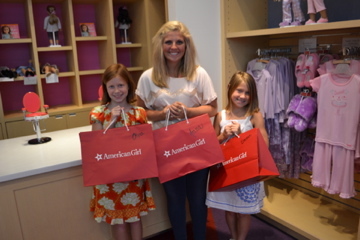 After all our dolls were done, we shopped a little. We also had a major icee issue. The girls were thirsty and we stopped at the Cookie Company and I let them get a small cherry icee. I hand them to the girls and think that I should give a warning not to spill, but don’t. I turn to pay and when I look back, Emma is wearing most of hers on her white dress. I am very mad- at myself for not warning her and at her for causing a lot of problems. She tells me the top popped off. I head to the car, get her changed in a bathroom and wash out her dress. It isn’t until later that she tells me she was actually blowing bubbles!! Yikes! Why in the world did she think that was a good idea? We head to the hotel and check in. We swim a little and then go to the Cheesecake Factory for dinner. It was A-MAZING!! We come home late that night and watch Hop on the TV in the hotel. We all snuggle down for a good sleep. I am so thankful for so many memories that were made today. We are one blessed family.